Did you know you can make your own flea and tick remedies? There are actually a lot of home remedies and alternative medicines that can be good for your dog's health. From aromatherapy to acupuncture, and everything in between, we've got you covered. Here are our favorite doggie home remedies and alternative medicines. 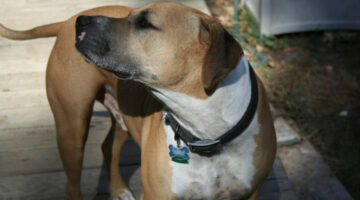 Does your dog have stinky ears? Ours does. Here’s a vet-recommended 2-step process to clean smelly dog ears AND treat a dog ear yeast infection. See the exact products my vet recommends, plus my personal experience following this dog ear infection remedy. My dog has cancer. Actually, I’ve had 2 dogs with 2 different types of cancer. One died soon after being diagnosed with bladder cancer. (The chemo treatments didn’t work.) The other was only given 3 to 6 months to live after being diagnosed with canine lung cancer — but he’s happy and healthy 2 years later after I chose a holistic cancer treatment for dogs. 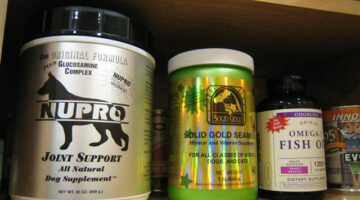 Here are the supplements for dogs with cancer that I’ve used, plus the dog cancer diet that he eats daily. Wondering what to do if your dog eats chicken bones?! First, don’t panic, most likely your dog will be ok. My dog ate chicken bones and he passed them just fine — but it depends on whether your dog gulps down the bones (bad), bites them into smaller pieces (bad), or grinds them down thoroughly before swallowing them (good). Here’s what to do if your dog ate chicken bones… OR turkey bones. Yes, puppy hiccups are normal. Here’s what causes hiccups in dogs, why they’re so common in puppies, how long dog hiccups last, what you can do to stop them, and how to prevent them from happening in the first place. Hot spots can quickly spiral out of control if you don’t treat them right away. Here’s the dog hot spot home remedy my vet recommended. Worked like a charm! I Finally Found The Perfect Dog Diarrhea Treatment! Our dog had a bout with diarrhea yesterday, and I spent all morning trying to find the perfect combination of human foods that he would eat and that would actually help to bind him up. I finally found it!… Here’s the recipe that cured my dog’s diarrhea in a matter of hours. Of all the dog diarrhea treatments I’ve tried, this one cures diarrhea in dogs the quickest. 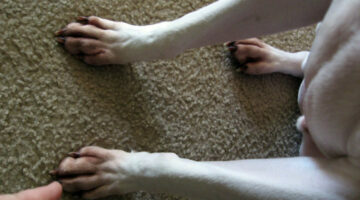 Does your dog have arthritis or joint pain? (Mine does.) Thinking of giving your dog Glucosamine or Chondroitin supplements for the first time? Here’s what I’ve learned after using Chondroitin and Glucosamine for dogs for several years now. Best Home Remedies For Fleas On Dogs: Which Natural Flea Treatment For Dogs Is Your Favorite? If your dog has fleas, then technically you do too. Fleas on dogs get into the nooks and crannies inside your house — from the floor boards to the baseboards to the carpet, rugs, and furniture. Here are the best natural flea control home remedies to get rid of fleas on your dog and in your house. PLUS, our best natural flea repellent recipe to prevent fleas from getting on your dog (and in your home) ever again! Do I Need To Call The Vet When My Dog Has Diarrhea? Or Can I Try Some Home Remedies for Doggie Diarrhea First? Struggling with a bad case of doggie diarrhea?… I used to work at a vet. While there, I learned a few ‘home remedies’ for some common pet ailments, including diarrhea. Here are the most common home remedies for treating a mild case of diarrhea in your dog. If your dog passes away at home, you have 3 options: vet, crematorium, burial. Here’s what you need to know about cremating or burying a dog. I’ve tried a BUNCH of recipes for DIY dog breath treats. Very few dramatically effect a dog’s bad breath. These are the ones I’ve found to have the greatest effect. Dogs & fleas… There’s no doubt about it, fleas are everywhere! Here are 4 ways to keep fleas from invading your dog AND your house. If your dog’s tongue sticks out all the time, it could eventually become dry and cracked — and painful — for your dog. Here’s what you should do to make sure that your dog’s tongue stays in the best condition possible. Most cases of dog vomiting will clear up within 24 hours or less using these tips. However, if your dog has not stopped vomiting within 24 hours, then you need to take your dog to to the vet because the vomiting is likely resulting from something more serious. Dog vitamins aren’t just for senior dogs. Vitamins should be given throughout your dog’s life in order to ensure that his senior years are just as healthy and active as his puppy years were. Here are the vitamins & supplements that are best for dogs. Does your dog suffer from joint pain? Here are some natural home remedies for treating dog joint pain. Plus tips on helping your older dog during his golden years.